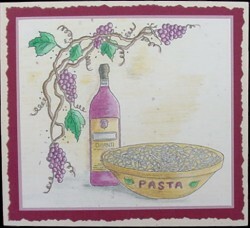 Stamp Pasta Bowl/Wine Bottle on confetti card stock, using Memories or black permanent ink. Using a stamp positioner, stamp Grapevines. Color with colored pencils. Layer onto light purple and dark purple card stock that has been cut with decorative scissors. Adhere to front of card with double stick tape. Note: A stamp positioner is not necessary, but very helpful.